The Standard 55TDMKD accessory comes without the Pipe, you can refer to the other Model Numbers for Standard Pipe sizes as indicated. Your particular application may require use of six-way guying via a TA55G (sold separately). 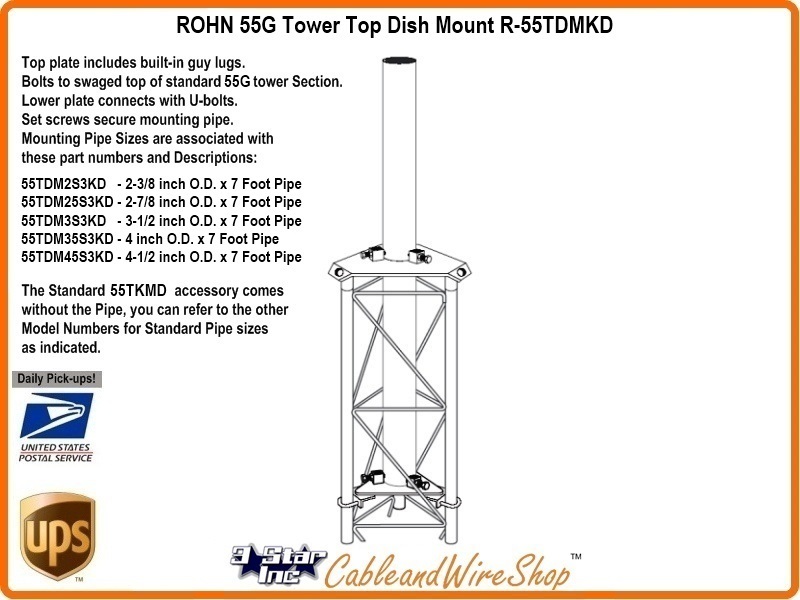 Note: ROHN 55TDMKD is Manufactured for Mounting a Real S/C/Ku Band Fixed, Offset or Steerable Dish (EL/AZ or Polar Mount) on the Top of your ROHN 55G Tower above any Trees and Buildings that may Block your view of the Satellite Orbital Arc (Clark Belt). For Tower Mounting 1.0 meter, 1.2 meter, 1.3 meter, 1.5 meter, 1.8 meter, 2.4 meter, 2.8 meter, 3.0 meter, 3.1 meter Satellite Dishes to receive SKY, IndoSat, BBC, Free to Air, Panamsat, ITV and other DBS Programming. Understand that the Physical characteristics of Composition (Solid vs Mesh) and Reflector Size will determine Wind Load that will influence the Height, Guying and Wind Survivability of the Dish, the ROHN 25G Tower and Structures they are mounted on. It is Suggested that Engineering (both Feasibility and Structural) precede any Potential Purchase of this Product Line for this purpose. ROHN Products, LLC nor 3 Star Inc, et al make no Engineering Representations as to the Suitability of this Product for use in conjuction with a Particular Dish/Mounting Scenario. The 55G is a true multi-use structure that provides excellent strength for applications up to 400´. It´s offered with either heavy steel tube or solid steel rod legs to satisfy a wide variety of needs under varied conditions. When properly installed, the standard tower will support the loads shown on various guyed and self-supporting information sheets in the ROHN catalog. Most Restrictions Allow for 50 feet of Height without the Necessity of Guy Wires, Anchors or Braces. However, No Tower is self supporting during construction! Always use temporary guys on the top most section, and install permanent guy wires as soon as a guy point height is reached. Wind Loading, Antenna Loading and Wind Survivability ratings vs. Height Documentation Provided by ROHN is available here as a Resource, but is by no means complete by itself or a susbstitution for Engineering Conducted Specific to your Application. Contact Us with any Questions you may have regarding Use prior to Purchase. All Information regarding the ROHN 55G Tower line, Parts and Accessories is as accurate and complete as we can possibly provide given that this Resource Offering is subject to change without Notice and is beyond Our Control.